The RegenePure shampoo system is made up of two revolutionary hair products that are expertly formulated to cleanse and nourish the hair and scalp. They contain world-class ingredients, including Ketoconazole, which has been proven to promote hair growth and prevent dandruff. Many shampoos contain harsh and damaging foaming agents that may make it seem like your hair is getting clean, but can ultimately damage your hair with long-term use. RegenePure products contain no harmful parabens, sulfates, chemicals, and colors, making them some of the safest cleansing products for normal or treated hair. 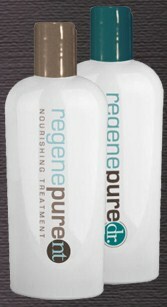 RegenePure DR: An intense topical formula designed to nourish and repair the scalp. It promises to moisturize without stripping the hair and is gentle enough for daily use. It contains ingredients that stimulate the scalp and hair follicles, as well as those that restore the hair. RegenePure NT: A gentle, moisturizing shampoo that deeply cleanses the hair and leaves it feeling fuller after just one application. One of its ingredients is lecithin, which has been shown in studies to be a powerful hair growth agent. It is also gentle enough to use on a daily basis. This line of products was developed by Salonceuticals, a New York and Miami-based Professional Hair Products Specialist. It is comprised of physicians, salon experts, fashion models and medical spa owners that work together to formulate the highest quality shampoo and hair care products for the scalp and hair. Visit the RegenePure site to purchase and to find much more information about the products.